The TEB is designed for maximum flexibility. Used with the Hammerfall series and the HDSP 9652, it can even be used at sample rates of 88.2 kHz and 96 kHz. Meeting the TDIF specification, Double Line mode uses two channels in single speed to get one channel in double speed. Therefore at 88.2/96 kHz 4 channels are available. Installation is done in a convenient manner using the supplied bracket. No PCI slot on the motherboard is needed. The integrated Clock Select Switch sets the TDIF reference clock, thus avoids any clocking problems even with 'problematic' TDIF devices. Using the Expansion Boards is very easy to do, thanks to the clearly structured and informative Settings dialog of RME's cards. The TEB operates like any other converter with ADAT input and output, but is connected internally. Therefore the input selector has to be set to 'Internal'. The TEB gets its clock either from the card or the external TDIF device. This is selected via the switch at the slot bracket. The ADAT output of all cards operate in parallel to this TDIF output. When Hammerfall or HDSP 9652 are operated in Double Speed mode, the TEB automatically converts the audio data to Double Line mode. Two TEBs can be connected and operated simultaneously. One TEB can be used together with either one AEBx-I or AEBx-O. TEBs use the internal ADAT interface of the DIGI cards. Therefore they do not work with the DIGI96 (which did not support ADAT). One TEB can be connected and operated. 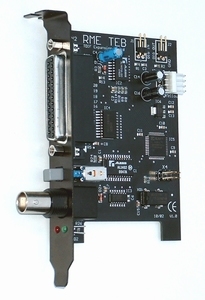 Multiface and Digiface use the Hammerfall DSP PCI card. This card has no internal inputs or outputs. Therefore no Expansion Boards can be used. An operation with the Hammerfall or Hammerfall Light requires board revision 1.5 or higher, because the internal connector ADAT1Out was not implemented in earlier versions. One TEB can be connected and operated. Additionally one AEBx-O can be used simultaneously.